For either of the two towns in Perak, Malaysia, see Bukit Merah, Perak. 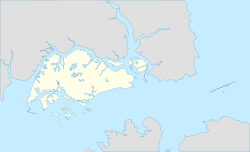 Bukit Merah (Chinese: 红山, Tamil: புக்கிட் மேரா), also abbreviated as either Bt Merah or BM, is a planning area and new town situated in the southernmost part of the Central Region of Singapore. The planning area borders Tanglin to the north, Queenstown to the west and the Downtown Core, Outram and Singapore River planning areas of the Central Area to the east. Bukit Merah also shares a maritime boundary with the Southern Islands planning area located beyond its southernmost point. Bukit Merah is the most populated planning area in the Central Region, and the 10th most populated planning area in the country overall, being home to more than 150,000 residents. Bukit Merah (Jawi: بوكيت ميره) translates to "Red Hill" in Malay, and is a reference to the red-coloured lateritic soil found on the hill. According to the Sejarah Melayu, Singapore used to be plagued by swordfish attacking the people living in the coastal regions. A young boy named Hang Nadim proposed an ingenious solution, to build a wall of banana stems along the coast at the present location of Tanjong Pagar. When the swordfish attacked, their snouts were stuck in the stems. With the swordfish problem solved, Hang Nadim earned great respect from the people, but also jealousy from the rulers. The King, Paduka Seri Maharaja, finally ordered his execution, and it was said that his blood soaked the soil of the hill where he was killed, giving rise to the red-coloured hill. The hill was eventually trimmed to its current state in 1973, when it made way for Redhill Close and what would eventually become Henderson Secondary School. During its existence, a Chinese cemetery was situated on the reverse side of this hill, which is today, the location of Tiong Bahru. 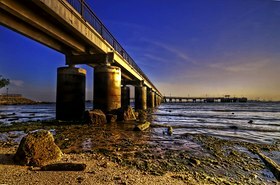 Keppel Harbour dates back to the 14th century when an ancient Chinese traveller, Wang Dayuan named the harbour as "Long-Ya-Men" or "Dragon Teeth Gate" after two rock outcrops located near Labrador Park, which resembled dragon's teeth. The two rock outcrops were subsequently blown up by the Straits Settlements Surveyor, John Thomson, in August 1848 to widen the entrance a new harbour. Mount Faber was once known as Telok Blangah Hill. Its name was changed to Mount Faber after Captain Edward Faber cut the road up to the top in 1845 to set up a signal station. The Singapore General Hospital site dates back to 1882. Labrador Nature Park was used as a defence outpost in the 19th century until World War II. With the earliest records of Bukit Merah's existence in the Malay Annals, the town had a huge role to play in the early maritime trade of the Kingdom of Singapura. The town's fertile red soil was employed to great effect, when it was a district rich in gambier cultivation during British colonial rule. Even before the industrialisation of Jurong, Bukit Merah already had a small head start in the emerging heavy industry market in Singapore. With the first brickwork factories and mills emerging in the precincts of Henderson Hill and Redhill as early as the 1930s. The town is also home to the first housing estate in the country, Tiong Bahru, which was developed by the Singapore Improvement Trust in the backdrop of a rapidly growing population in post-war Singapore. The estate later became the basis of what would eventually become the first new town in the Republic, Queenstown. The Bukit Merah–Central Area boundary line along Outram Road as seen from Bukit Merah. 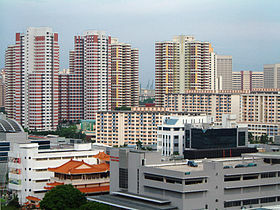 According to the various master plans laid out by the Urban Redevelopment Authority, Bukit Merah is bounded by Alexandra Canal and the Singapore River to the north and Harbourfront and Keppel Bay to the south, Kim Seng Road, Outram Road and Cantonment Road to the east and Alexandra Road to the west. There are several subzones within the planning area, namely Alexandra, Bukit Ho Swee, Bukit Merah Central, Depot Road, Everton Park, HarbourFront, Henderson, Redhill, Singapore General Hospital, Telok Blangah and Tiong Bahru. Havelock MRT Station of the Thomson-East Coast Line, that will be operational in 2021, is situated near to the Bukit Ho Swee estate, making Bukit Merah the planning area that has the second-most number of MRT lines passing through it, following the Central Area. The future stations, Keppel and Cantonment will be located within the new town as part of the Stage 6 of the Circle Line that will be completed by 2025. Gan Eng Seng School is one of the oldest schools in Singapore. It is located along Henderson Road. Bukit Merah consists of several Primary and Secondary schools with Alexandra Primary School being the newest school. The main facade of Tiong Bahru Plaza, after its refurbishment in 2016. Panoramic view of Bukit Merah, with the Central Area in the background, from Mount Faber. Bukit Merah belongs to five political divisions in four constituencies. A large portion of Bukit Merah is under Tanjong Pagar GRC, with some areas under Jalan Besar GRC , Radin Mas SMC and West Coast GRC, served by the People's Action Party. Indranee Rajah is the current Member of Parliament for the Tanjong Pagar-Tiong Bahru division, while Joan Pereira is the current Member of Parliament for the Henderson-Dawson division of the Tanjong Pagar GRC since 2015. Sam Tan is the current Member of Parliament for Radin Mas SMC since 2011 while Lim Hng Kiang is the Member of Parliament for the Telok Blangah division of West Coast GRC. Lily Neo is the current Member of Parliament for the Kreta Ayer-Kim Seng division of the Jalan Besar GRC. Wikimedia Commons has media related to Bukit Merah. ^ "Statistics Singapore - Geographic Distribution - 2018 Latest Data". Retrieved February 11, 2019. ^ "Singapore Residents by Planning Area/Subzone, 2015". Singapore Department of Statistics. Archived from the original (XLS) on 10 June 2016. Retrieved 24 May 2016. ^ "Statistics Singapore – Geographic Distribution". singstat.gov.sg. Retrieved 6 June 2017. ^ "Bukit Merah Town Centre". lostnfiledsg. Retrieved 9 November 2015. ^ "Singapore Bukit Merah Map & Bukit Merah Singapore". streetdirectory.com. Retrieved 9 November 2015. ^ "Singapore Infopedia – Bukit Merah". National Library Board. ^ "ALEXANDRA BRICKWORKS". The Straits Times. 17 February 1931. ^ "Three new stations to close loop on Circle Line". TODAYonline. Retrieved 13 March 2016. This page was last edited on 11 February 2019, at 12:47 (UTC).